While most people enjoy a glass of wine or other alcoholic beverages from time to time, it’s best to discourage diabetic seniors from alcohol consumption. Numerous studies show that diabetics who drink alcohol are putting themselves at great risk. 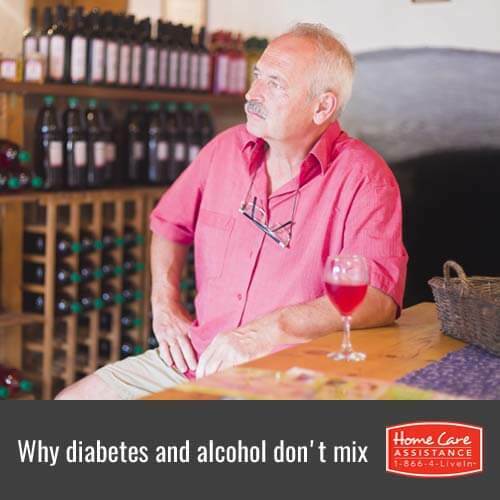 In the following article, Rhode Island live-in home care providers explain why seniors with diabetes should abstain from alcoholic beverages. People with diabetes are advised to limit their intake of sugary candies, desserts, and drinks because foods with high amounts of sugar and carbohydrates (which metabolize as sugar during digestion) affect blood sugar levels. Eating or drinking too much sugary food or having these foods or beverages too often can cause serious complications like unstable blood sugar. Alcohol has high sugar content and therefore falls under the umbrella of sugary drinks diabetics should avoid in order to help keep blood sugar levels steady. Like most high-sugar foods, alcohol can cause blood sugar to spike quickly and then suddenly drop. Fluctuations in sugar highs and lows, especially over a short period of time, can cause many unpleasant side effects such as nausea, headache, and dizziness. Additionally, the normal side effects that come from drinking alcohol are the same as the symptoms of low blood sugar. This means that unless a diabetic constantly checks his or her blood sugar, it’s very difficult to tell whether the alcohol or low blood sugar is to blame for the symptoms. A sugar low is something to take seriously because it can be fatal if not detected and treated. Some medications diabetics take can be very dangerous to combine with alcohol due to the spikes and lows that follow alcohol consumption. Combining diabetic medications designed to lower sugar, such as sulfonylureas and meglitinides, with alcohol can be hard on the body, particularly the pancreas and liver. Even if diabetics only take sugar-lowering medications at another time of day or after a meal, the medications can still be working in the system later on and clash with any alcohol you consume toward the end of the day. Drinking negatively affects the liver when alcohol is consumed in mass quantities, but this is especially true for people with diabetes. Among diabetics, the liver must work extra hard to help regulate blood sugar. When a diabetic drinks alcohol, the liver is diverted from managing blood sugar to trying to filter the alcohol level from your blood. Drinking alcohol makes people hungry and as a result, eating and alcohol consumption tend to go hand-in-hand. This can be problematic for people with diabetes. When diabetics are stimulated to eat, they may overeat or choose larger portions than they normally would. The extra calories and carbs ingested may lead to weight gain or further lack of control in the future, both of which may significantly worsen diabetes. Alcohol impacts our minds and our decision-making skills before we ever feel the effects. Judgment and willpower may be lessened due to the feel-good buzz people get from alcohol. For diabetics, this lack of good decision making can cause them to drink more than they planned or take other risks they normally wouldn’t. Seniors with diabetes are at a greater risk of complications from alcohol consumption because they often take other medications for common ailments associated with age. To help your senior loved one manage their diabetes and prevent complications, reach out to Home Care Assistance. We provide elderly care Rhode Island seniors and families can trust, including periodic medication reminders, healthy meal preparation, and regular physical activity to maintain senior health and wellness. Call an experienced Care Manager today at 401.284.0979 and schedule a free in-home consultation for the senior loved one in your life.